Last Friday, Oct. 27, “Japan Day” kicked off in the University’s Student Center Ballroom with a multi-media presentation depicting the relationship between Mississippi and Japan and exposing viewers to Japanese language and culture. Hosted by Jackson State University, the W.E.B. DuBois Maria Luisa Alvarez Harvey Honors College, JSU Global and other campus departments, the event was an extension of the 2016-2017 TOMODACHI (friends in Japanese) Inouye Scholars Program. Dr. Pamala Heard, director of Honor Student Services and Activities, expressed the importance of students learning about other cultures and being exposed to diverse opportunities. “I believe the Japan culture introduction was important because learning how they do things is beneficial. Sometimes we, as people, have stereotypes about different cultures, and we need to open our hearts and our minds to understanding,” Heard said. JSU was one of four schools throughout the country and the only Mississippi school and Historically Black College and University (HBCU) chosen for the TOMODACHI program. Last March, Jackson State partnered with the Miyagi University of Education and sent 23 students on a fully-funded educational study tour of Japan. 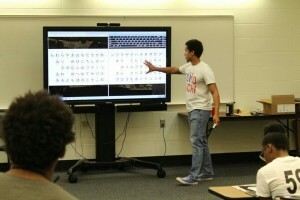 Japanese students also visited JSU and the Jackson area as part of this program. 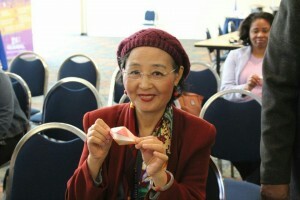 One attendee shows off her origami skills at the all-day “Japan Day” event that illustrated the significance of making cultural connections. “Students gain knowledge on what Japan’s culture is all about, how the Japanese live day-to-day, similarities we share, our differences and how we can adjust and learn from each other,” Heard added. During “Japan Day,” attendees, including students from Blackburn Middle School, were also treated to a pre-recorded video greeting from Japanese friends of JSU students, who connected through the program, and several Japanese themed activities like origami, sushi making, and a calligraphy session. JSU senior Kiana McFadden, who studied in Japan last spring, taught participants how to make sushi and eat with chopsticks. Although raw meat could not be used per University standards, students were still able to learn the process using cooked meat and veggies. “I thought it was important for them to understand some of the ways that Japanese citizens eat food,” said McFadden, an earth systems science major. TOMODACHI scholars also led the Origami workshop and presented a brief history of the art of folding flat paper, where they pointed out its importance to Japanese recreation and ceremonial affairs. The calligraphy session concluded “Japan Day” and was led by Jamal Keyes, a senior Physics Pre-Med major, who is also part of the TOMODACHI Scholars program. After coming back from Japan, he learned writing in Hiragana, Katakana, and Kanji, three Japanese writing systems. “Those really peaked my interest when I saw them in video games or anime,” explained Keyes, who is also interested in teaching in Japan. 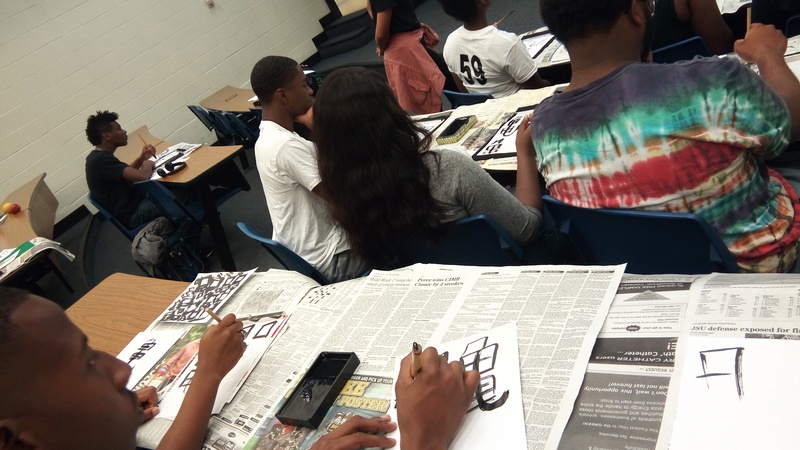 Dozens of students attended the calligraphy workshop and seemed to enjoy learning how to write their own names in Japanese using Sumi ink and bamboo brush borrowed from the Japanese embassy in Tennessee. Michael Ware, a junior Sociology major, delicately stroked press ink on his white paper in an attempt to write his name in Katakana. “Calligraphy to me is an art of writing,” he said.